Home Industrials Cortec Corporation EcoAir® VpCI®-337 Offers Convenient, Environmentally Friendly Corrosion Protection in Recyclable Cans! EcoAir® VpCI®-337 Offers Convenient, Environmentally Friendly Corrosion Protection in Recyclable Cans! Cortec® is eager to provide convenient, environmentally friendly solutions to corrosion problems. One of those important innovative solutions is the EcoAir® VpCI®-337 Fogger. EcoAir® VpCI®-337 is a convenient way to get the excellent tried-and-true corrosion protection of VpCI®-337 in an easy-to-use spray can powered by compressed air. On its own, VpCI®-337 is a powerful biodegradable waterborne vapor corrosion inhibitor used to protect metal parts and internal void spaces with a thin, environmentally friendly self-healing film. Vapor phase Corrosion Inhibitors (VpCIs) in the fluid migrate and protect metal surfaces, resulting in time and cost savings and using a minimum amount of product. VpCI®-337 is consistently successful in providing protection to basic metal, metalworking, and packaging industries. In most cases, products protected by EcoAir® VpCI®-337 Fogger are ready-to-use—with no degreasing or stripping necessary. The metal will retain a clean, corrosion-free surface, and the thin protective film will not affect paintability, conductivity, appearance, or any other important property of metals or alloys. In testing the performance capabilities of EcoAir® VpCI®-337, the Cortec® lab found that an EcoAir® can effectively sprays VpCI®-337 a distance of approximately 40 inches (101.6 cm). On average, a full can will last for four and a half minutes of constant spraying. Coverage rate is approximately 0.3-1.0 fluid ounces (8.87-29.57 ml) per cubic foot (0.03 m3), meaning 4-6 ounces (118.29-177.44 ml) of spray will protect a metal void space 12.7 cubic feet (0.36 m3) in volume. Cortec’s EcoAir® VpCI®-337 makes corrosion protection immediate, effective, and extremely convenient to apply and discard without special environmental concerns. 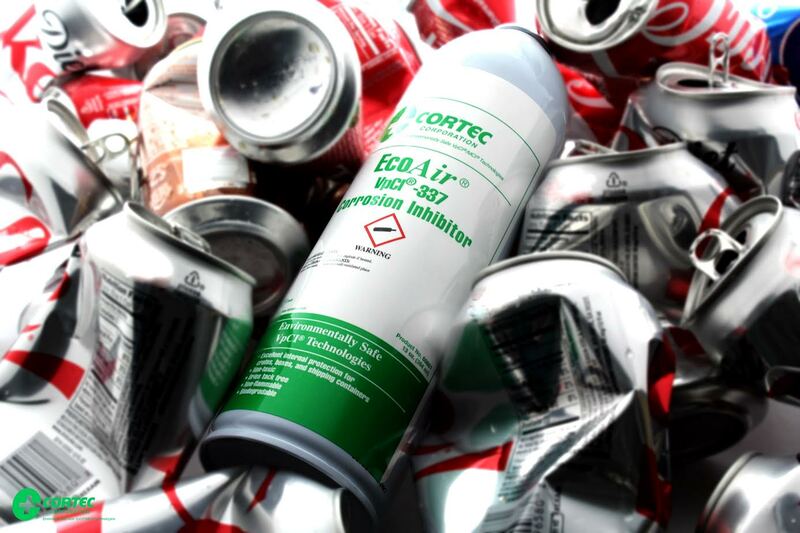 By packaging this biodegradable corrosion inhibitor in a recyclable can, Cortec® has created an excellent alternative both to hazardous corrosion inhibiting chemicals and environmentally damaging aerosol cans. Cortec’s EcoAir® VpCI®-337 Fogger conforms to the following standard test methods: ASTM D-1735 (Water Fog Cabinet), ASTM D-1748 (Humidity Cabinet), and NACE RP0487-2000 (Selection of Rust Preventives. *It is always a good idea to verify and comply with local regulations. Research Paper on Biobased Anti-Corrosion Coatings To Be Presented at EuroCorr 2017 by Cortec® Corporation! Cortec’s Daughter Company Announces New Brochure: High-Tech Integrated Solutions for Corrosion Protection!